Joyce Glasser reviews The Guardians (Les gardiennes) (August 17, 2018) Cert. 15, 135 min. 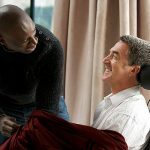 Xavier Beauvois is best known for his powerful, acclaimed film from 2010, Of Gods and Men. It is based on the true story of a group of monks who live in harmony with the Muslim population around them until seven monks are murdered during the Algerian Civil War. War, betrayal and a close knit family form the background of Beauvois’ new film, The Guardians as well, a French Tess of the D’Urbervilles saga about love, lineage, class and betrayal among women keeping the home fires burning in WWI. In French, the title carries a bigger punch as it is in the feminine. The film opens with a contrast that remains throughout the film. 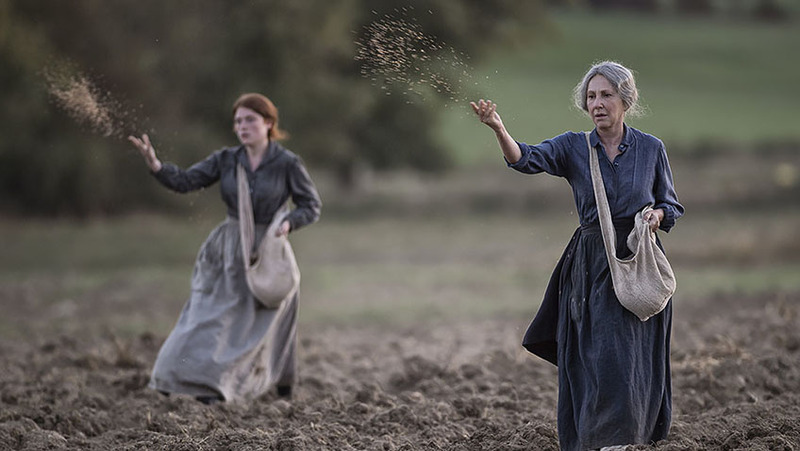 We see the dead bodies of soldiers spread across a waste land and then a woman in her sixties ploughing a fertile field – the men’s work that women must now assume. The woman with grey hair is Hortense, played by Nathalie Baye in a welcome return to our screens). While her jovial, but arthritic husband, Henri (Gilbert Bonneau, a 78-year-old farmer with no acting experience) lives on the farm, he spends his time making wine, much of which is for personal consumption. Hortense maintains the farm with her intelligent daughter, Solange (Baye’s real life daughter, Laura Smet) while her two unmarried sons and a son-in-law (Solange’s husband) are at the front. When school teacher, Constant (Nicolas Giraud) returns home on overnight leave, he pretends to be in good spirits for his mother’s sake. Solange takes her handsome brother into the one-room school class, believing contact with the children will do him good, but he can no longer speak to them. He leaves the baffled children behind and rushes out, a broken man. If this is arguably the most haunting and sincerely felt scene in the film, it could be because the film is based on the book by real life school teacher Ernest Pérochon who served on the front. During his short visit Constant tells his mother to hire an extra farm hand before the harvest, and advises his sister to adapt to the new technologies that will make the farm work easier. Both eventually act on his suggestions. In 1916, with a shortage of farm workers, Hortense hires Francine, an orphaned house maid (newcomer Iris Bry) who is a young, well-mannered, red-headed beauty. She says little, but buckles down to work and never stops. Hortense is impressed and asks her to stay on. This suits Francine as she has by harvest time met Hortense’s second son, Georges (Cyril Descours). He flirts with Francine despite the presence of a plain-looking, childhood friend who lives with the family and always believed that Georges would one day be hers. Confident of Hortense’s approval, when Georges asks Francine to write to him, she agrees. Tragic news about Constant is followed by the news that Clovis is believed to have been taken a POW. Georges seduces a willing Francine and lonely Solange flirts with a handsome, friendly American GI (Yann Bean) who is in charge of procuring food for the neighbouring American forces. Hortense confronts Solange whom she sees in the woods with the soldier and reminds her of the gossip. 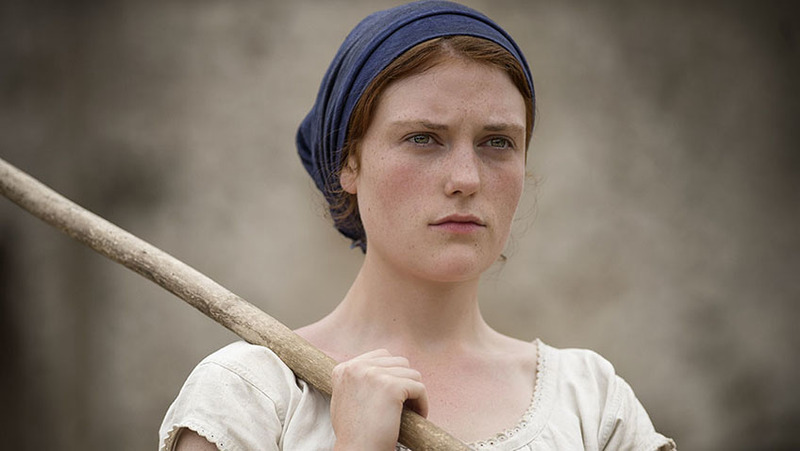 Behind the gossip is the sting of jealousy as Hortense is the only farm owner around to be in profit thanks to the Americans and to Francine’s tireless work. The dilemma leaves Hortense conflicted but, iron willed, she does what she has to do. It is not enough for the proud Hortense to believe Solange’s denial (which she does) and maintain that she does not care what others think. She needs a scapegoat. Caroline Champetier’s (who also shot Of Gods and Men) cinematography is so lush and beautiful that it keeps us watching, even though the story is rather bland and contrived. Champetier and Beauvois take their time, showing us the sowing, the ploughing, the harvesting and the cow milking (another source of income). The cold, the sweat, the dirt, the warmth of a fire, everything about the look of the film feels real, like a Dutch 17th century painting. After the prologue in which we see dead soldiers lying in the mud of the battlefield, war is a train ride away, beyond earshot. Death is off camera, though never far from the family’s precious land that Clovis and George will argue over, just as the Allies are carving up the land that is the spoils of war. While the sumptuous images are pulling at your emotions, the soap-opera tragedy unfolding is less compelling. Given that Solange cannot have children (we learn this early on) and that Constant will not, two of her children are not going to give her heirs. In this context, Hortense’s cruel deceit and betrayal seem counter-productive and inexplicable. Baye’s face is so expressive that it might leave you as confused as she is conflicted. Class and lineage become the predominant theme of the film in the final third and seems to motivate the characters and drive the plot; but for most of the film it is hardly a concern as Francine becomes one of the family. In an important scene toward the end of the film we learn that Francine has come into a sizeable amount of money, that, when combined with her salary that she has saved over the war, will make her self-sufficient. She confirms as much to the Mayor of the town when she tells him her plans (it would be a spoiler to reveal more) and impresses him with her strength. Yet we never have the satisfaction of seeing her plan materialise like justice prevailing.